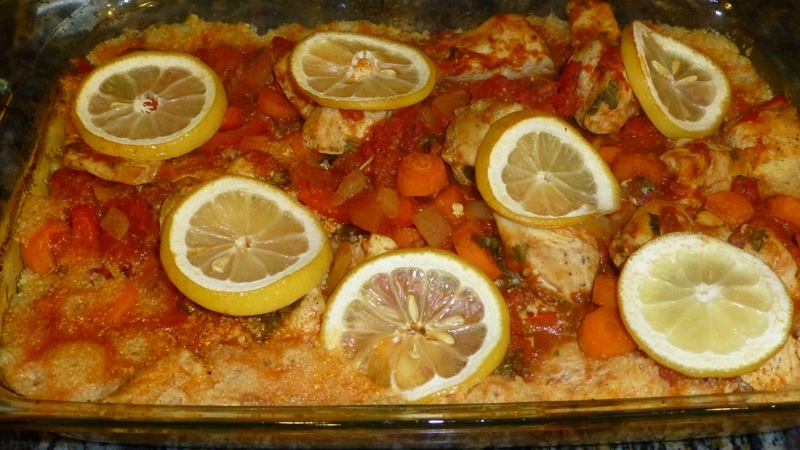 This Moroccan Chicken Casserole was good BUT it did take some time to make. Don’t put it on your “simple” recipes list. Some of the steps you’ll need to take … cutting and grating the cauliflower. Yup — cauliflower. This is definitely a paleo recipe so the cauliflower base is unique. Next you’ll be making the sauce that will eventually go over the grated cauliflower. Chop the head of cauliflower into small pieces then add them to a food processor and grate it until it’s somewhat fine. 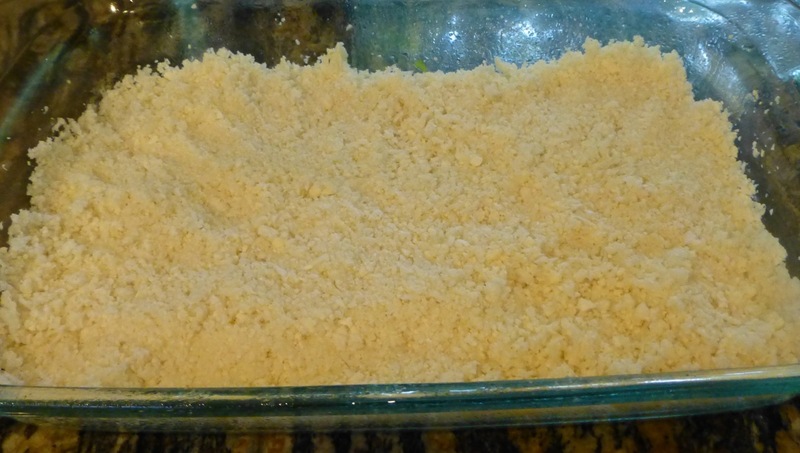 Spread the grated cauliflower out in a 9×13 rectangular baking pan. Melt 1 tablespoon of butter in a deep pan over high heat. Add the chicken, browning it well, about 3-5 minutes a side. Remove the chicken from the hot pan and set it aside. Turn the heat down to medium and add the onion, ginger, garlic and carrots. Cook everything through until the onions are soft. Add the remaining tablespoon of butter and all the spices then stir well. 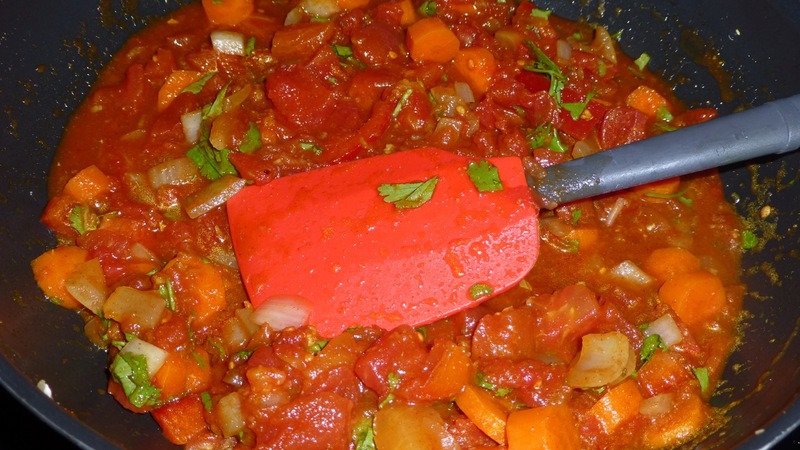 Add the red pepper, can of tomatoes including the liquid, minced cilantro and salt. 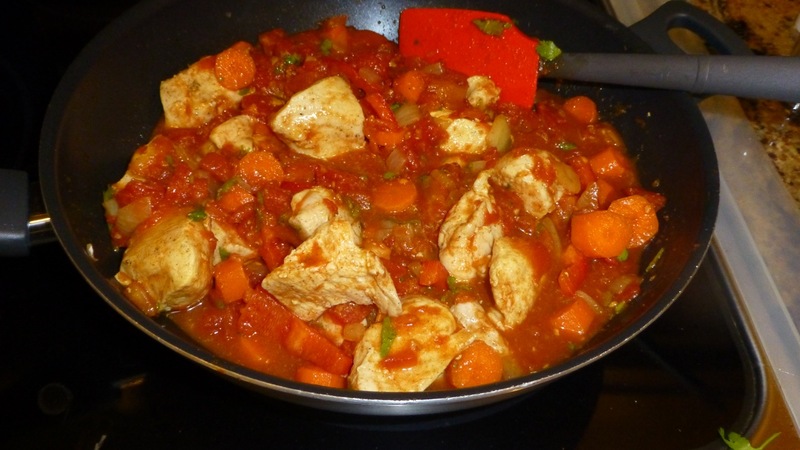 Return the chicken to the pot with the sauce in it and simmer for 5 minutes then remove everything from the heat. Pour the chicken mixture over the cauliflower so the cauliflower is completely covered by the sauce. Slice a lemon into thin slices and layer it on top of the casserole. Cover the pan with tin foil and bake for 35 minutes. Remove the tin foil and cook for 25 minutes more. That’s it! Whew! That’s enough. There’s a lot of measuring and chopping in this recipe. But it’s worth your trouble. Just make sure you have everything done ahead of time. Now — enjoy! I served mine with steamed broccoli — a healthy and simple side dish.